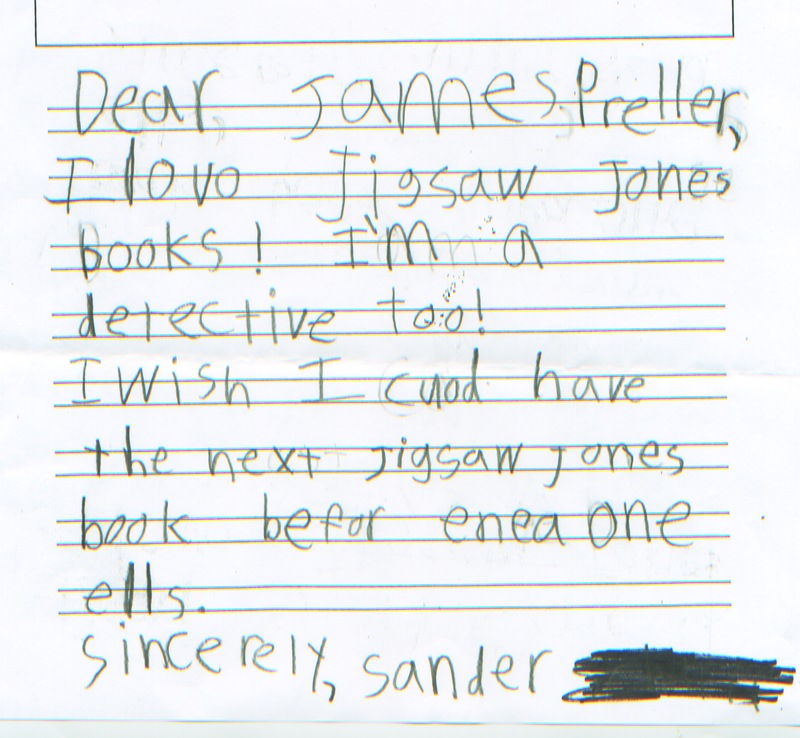 Look here, it’s a letter from Sander! Thanks so much for your letter. Thanks, also, for including a Self-Addressed, Stamped Envelope, otherwise known as a SASE. Since you are a detective, I wonder if you can figure out why they call it a “SASE”? Anyway, I am glad to hear from a detective. I’m always looking for new ideas. Have you solved many mysteries? 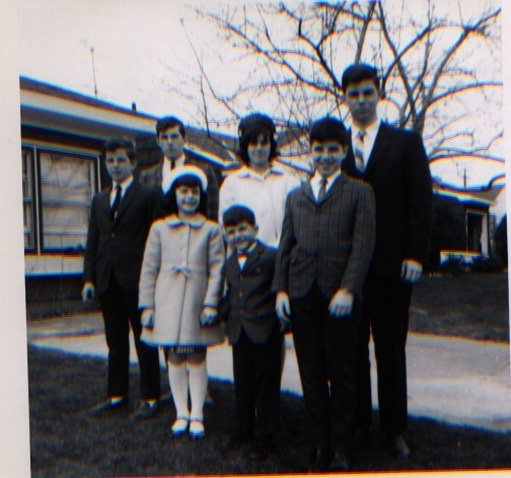 Here’s the seven Preller children in 1966. I’m the short one in the middle, surrounded by GIANTS! While I was not a detective like you, I was a spy. I fondly remember a particular toy I had — it was a periscope that extended way out — which allowed me to peer around corners to spy on my family. I loved sneaking around in my socks (better for silent creeping). It was like being invisible! But before you try it yourself, let me warn you: It’s dangerous work. Don’t get caught. 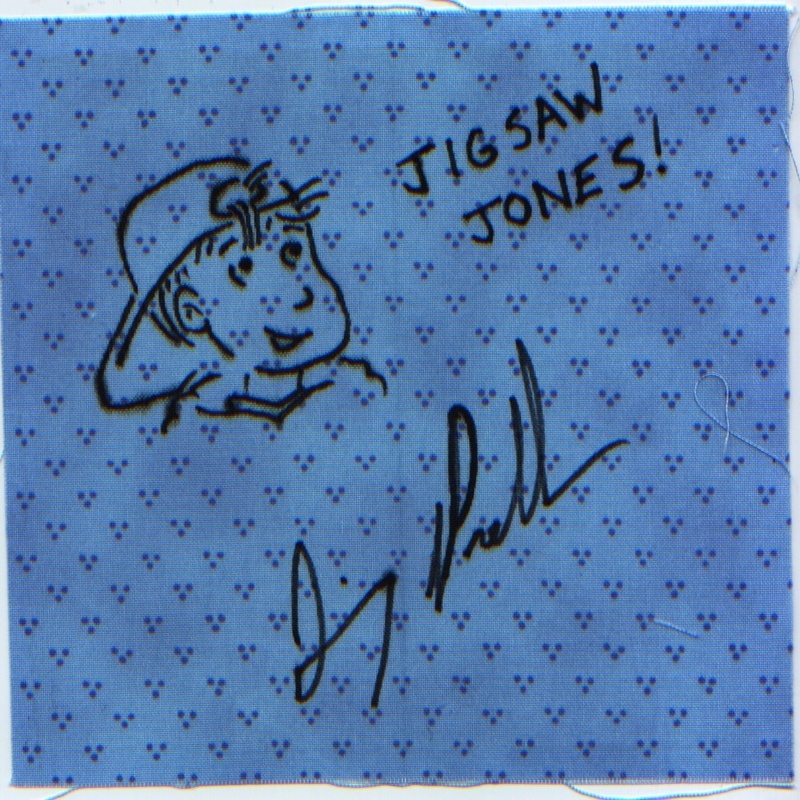 I even gave a version of my childhood toy to Jigsaw Jones. He uses it to solve a mystery in THE CASE OF THE BICYCLE BANDIT. Cool, right? I like your wish. No one has ever expressed that to me before. You must be an original thinker. That means you think of things that nobody else in the world has ever thought. Amazing. I’m very impressed. You have a good mind. It must be all that reading! 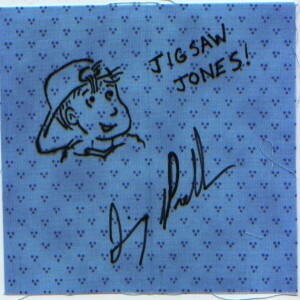 I have not written a Jigsaw Jones book in the past six years. However, I have happy news. I am writing a new one right now! I mean, I’ll be writing it after I finish writing to you. I wish I could tell you more about the story, but to be honest, it’s still a mystery to me. I don’t know what’s going to happen yet. The book won’t be out until the year 2017. I expect you’ll be shaving by then. Good luck with your detective work. Life is a mystery — we sure do need more good detectives around to help us figure it out. My best to you, and happy holidays! Fan Mail Wednesday #165: Ah-choo! Here’s a face no one could deny . . . So I blew my nose in it. Then I read your letter and got a sinking feeling. I looked at the (used, soggy) piece of material. I have to admit: I’m a really good nose-blower! I hope you don’t mind. Hey, just a thought. Why don’t you forget about all those other crummy author’s and illustrator’s and instead make one, giant “James Preller” quilt? The whole thing could be like, I don’t know, my head — giant-sized. My great, big smiling gob! Listen, Jillian, I’m not an expert, and I don’t work at Bed, Bath, & Beyond, but that sounds like a pretty terrific-looking quilt, if you ask me. Don’t you agree? I’ll tell you this, Jillian. You are one lucky girl to have an awesome grandma like that. My grandmother just sat around, watched soap operas on television, sipped an afternoon glass of sherry, and challenged us to spell impossible words. “Huh? What was that, grandma?” I’d ask. 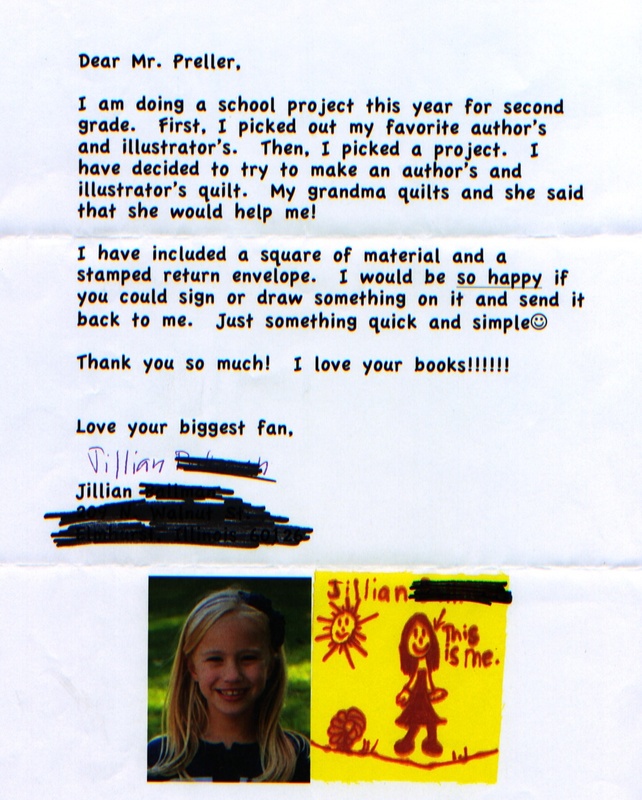 I’ll telling you, Jillian, this happened all the time. Granny didn’t make any quilts, I’ll tell you that much. So be sure to give your granny a big hug of thanks. I bet your grandmother thinks she’s the lucky one to have you! Well, I guess you’re both pretty lucky. Me, too. Ah-choo! No problem, I’ve got a hanky right here — oh, darn. Sorry about that! P.S. 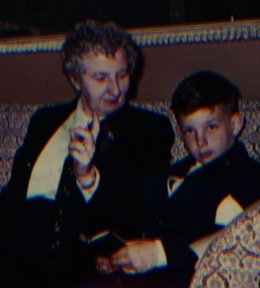 : Thanks for helping me remember my own Grandma Bridgie. We called her Granny Good Witch. And she always, always had a little dish of hard candy — butterscotch, mostly — at her house in Queens Village, NY. Nooooo, wise guys, I didn’t decide to be some forlorn 70’s kid for Halloween. That’s my actual life we’re looking at. Don’t I look thrilled? 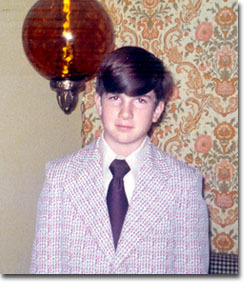 I lived with that lamp, that wallpaper, those wide lapels in Wantagh, Long Island. Analyzing the photo further, you get a hint of the black-and-white cushioned chair against the backdrop of that wallpaper. Just imagine living with that visual collision of patterns . . . all the time. Welcome to my world. Actually, these photos are the result of more housekeeping. I finally fixed some broken links on my BIO page. Here’s my whole family, all seven of us, from a slightly earlier time: I’m the baby, up front and left-of-center. Which is still true today. 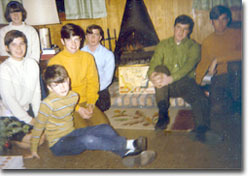 My oldest brother, Neal, went off to Princeton around that time, and came back a long-haired freak! My next oldest, Billy, dropped out of college and was soon drafted into Vietnam. He returned a short-haired freak — but the important thing was that he returned. Times changed pretty fast during The Nixon Era. I always wanted to set a book in that period, 1969-70, my year of small miracles. Not a memoir, but fiction grounded in that time period. When my mother woke me early one morning to watch a grainy television picture of Neil Armstrong walking on the moon; and even more amazing, when I saw the Mets take Game Five of the World Series. Cleon Jones caught that final out, dropped down to one knee, squeezed it tight. And somehow, through that wild season, we had survived. By the way, this is my 100th post!